A coastal ocean observing system (COOS) is a combination of many components— from hardware to humans — used to gather information and turn it into useful products that support human populations, coastal economies and a healthy, sustainable environment. 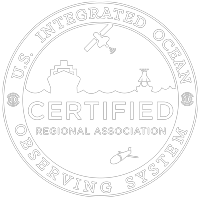 Each coastal ocean observing system uses a variety of platforms to collect data. The following are the major types of platforms used in SECOORA. Moorings, often called buoys, include a number of technologies that are anchored, i.e. moored, to the ocean floor with a floating surface structure. Buoys can be for a single purpose such as waves or include a variety of sensors mounted both above and below the water surface. Most buoys relay data back to shore in real-time. Profiling buoys include sensor packages that regularly move up and down the mooring rope providing a comprehensive look at the water quality. Buoys can be outfitted with sensors for wind, waves, currents, salinity, chlorophyll a, and other ocean chemistry and biology parameters. Shores stations are installed on coastal beaches, islands, on piers and offshore platforms to measure wind speed, gust and direction, air temperature, relative humidity, barometric pressure, solar radiation, rainfall, water temperature data and more. These basic measurements provide important real time information on storms and help predict changes to the weather. When measurements are collected over a long time period, they can also help predict changes in the climate. A glider is an autonomous, unmanned underwater vehicle that can be equipped with sensors that can measure ocean properties such as water temperature, chlorophyll a, salinity and fish acoustics. It sawtooths up and down the water column following a GPS path set by the researcher. Every few hours the glider surfaces to call home, transmits data and awaits further instructions. Gliders are flexible platforms that can be used for continuous monitoring or deployed in the event of an oil spill or harmful algae bloom or other major events. Ships have been used to collect ocean information since the days of Captain Cook. Research and fisheries vessels carry a variety of sensors to gather physical, chemical and biological information on ocean conditions along the cruise route. Some sensors are mounted on the ship and take regular measurements of water and atmospheric conditions. Scientists also deploy instruments into the ocean and Great Lakes to gather information on conditions throughout the water column. Land-based High Frequency radar (HFR) provide real-time information on the speed and direction of surface currents over a large coverage area. This information can be useful in tracking oil or other hazardous materials such as harmful algal blooms. Because of the large coverage area, HFR data also are valuable input for ocean models and for assisting with search and rescue operations at sea. SECOORA operates the Southeast HFR network to provide data to the Coast Guard and NOAA for use in search and rescue and spill response. Observations from satellites are an essential component of SECOORA. Earth observing satellites orbit the Earth at an altitude of 500 to over 20,000 miles and collect imagery that allows us to measure ocean conditions including sea surface temperature, ocean color, and sea surface height. Satellite data can be used to identify ocean fronts, harmful algae blooms, oil spills, hurricanes and polar ice distributions. Data management is key to the success of SECOORA. The goal of the SECOORA data strategy is to ensure that users have seamless access to quality and timely data, in a format they can access and understand. SECOORA data management uses state-of-the art information technology (IT) techniques to integrate data from multiple Federal and non-Federal sources, makeng both current real time and historical data available. SECOORA engages with various user communities to understand their information needs – how they use the data, how often, in what format and for what purposes – in order to transform raw data into useful information. Websites are the primary way users access the information they need but at user requests, data is also made available through smart phone apps and on marine radio reports. Example products include: real-time information on sea state conditions for mariners; early warning for flooding or harmful algae blooms; water quality information for shellfish growers, beach goers and more. Statistical and numerical models are powerful tools that can forecast ocean and Great Lake conditions. SECOORA observation data is incorporated into computer models that simulate the coastal environment. Models can be used to forecast circulation patterns, flooding, the movement of harmful algae, fish larvae or pollutants through the ecosystem and more.